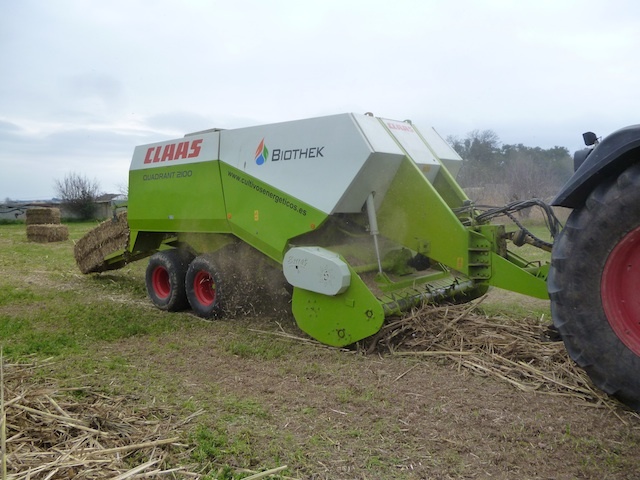 Due to the energy requirements demanded both by society and by a modern and environmentally-committed industry, Biothek Ecologic Fuel promotes the Arundo-K12 clone with the aim of covering the current bioenergy and industrial requirements while preserving its ethical and moral commitment. 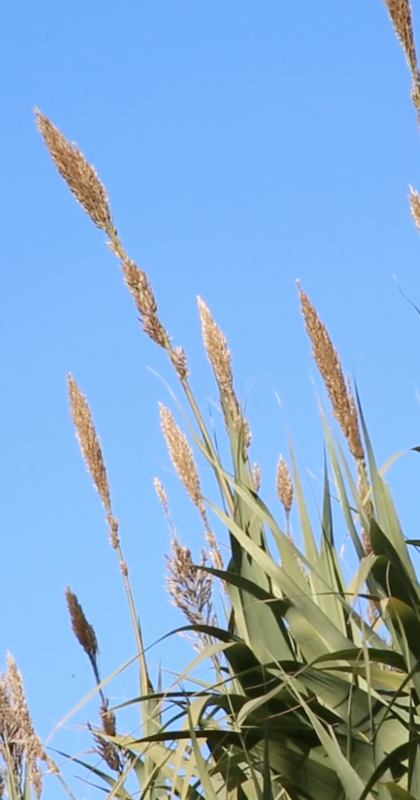 Arundo-K12 is catalogued as a second-generation energy crop. Plant variety of non-food use, used to produce lignocellulosic biomass specifically aimed at obtaining bioenergy. Today Arundo-K12 is promoted as one of the most productive, versatile and profitable energy crops for the bioenergy industry. Arundo K-12 is currently used to manufacture pellet, which is used as a solid fuel. A market in continuous growth, it is a very interesting business for rural areas where industrialisation and competitiveness are the only way to create wealth and retain population. It is also used as raw material to produce second-generation biothanol and to obtain synthetic diesel. Likewise, it may be used as raw material in the textile and paper industries. Arundo k-12 is a clone selected from the variety Arundo D, which differs mainly from any other variety because it is considered genetically stable and free from any type of virus. Developed with the most-advanced in vitro systems on the market, a genetic variety has been achieved that will undoubtedly mark a viable alternative to the existing options, giving the bioenergy market a totally different, innovative, safe and profitable approach. Arundo-K12 is of an herbaceous origin and the ‘official’ photosynthetic route is type C3, which is the most common route among plant species of temperate climates. Several scientific institutes however argue that this species could have a hybrid route similar to that of other plants in the world. Arundo K-12 is particularly noteworthy for its versatility, as it is useful for a large variety of applications and energy models, its main uses being currently focused on the bioenergy, paper and biocorrector sectors. Within the energy section, outstanding are the uses of solid biomass for thermal models, green biomass for biogas (digestion by anaerobic fermentation) and the use for the production of second-generation biofuels. Another of its great hallmarks is undoubtedly its resistance and natural adaptability to any environment and climate condition, thereby conferring a unique versatility. Another point where Arundo-K12 stands out is in the biomass yields, as these are superior to those of any variety. “] The crop’s growth period in continental and Mediterranean climates stretches from the end of the winter or beginning of spring, until the end of autumn. In subtropical or tropical climates the growth depends on the seasons (dry, rainy or linear) and the harvesting mode will have a direct effect. Once it establishes, the species forms, very fast and in a natural manner, compact masses or groups of very dense stems, due to the horizontal proliferation of the rhizomes and their easy sprouting, giving rise to practically monotypic colonies. In full season the stems’ growth rate can be 30 to 70 cm per week, until reaching 3 to 6 meters’ height. In some cases stems of up to 9 m height have been cited. The length of the internodes can reach 30 cm and a “leaf” grows on each node. Not all the shoots give panicles; some of the critical factors for flowering to take place are the state of development and the age of the shoot, as well as the environmental conditions; thus, in continental climates, it does not usually flower. Later on, in the winter season, a rest period or period of slow growth follows, where the above-ground part of the plant mass does not die. If the winter is very cold, the plant mass appears dry, and the stem areas that are exposed (part not protected by the leaf sheathes) may appear to be reddish in colour. This is when the humidity content of the above-ground biomass is at its lowest. When the conditions are more favourable however, at the end of the winter/rainy period, and in the case the above-ground biomass has not been cut, the leaf axillary buds that are nearest to the top end sprout, giving rise to branches. In this period, the new shoots emerge from the rhizomes, regardless of whether the above-ground biomass has been cut or not. The rhizomes are near the surface of the ground, normally between 5 to 15 cm deep, and slowly spread gradually forming compact masses. Strong fibrous roots of up to 1 m long emerge from the rhizomes and penetrate deeply into the soil profile. 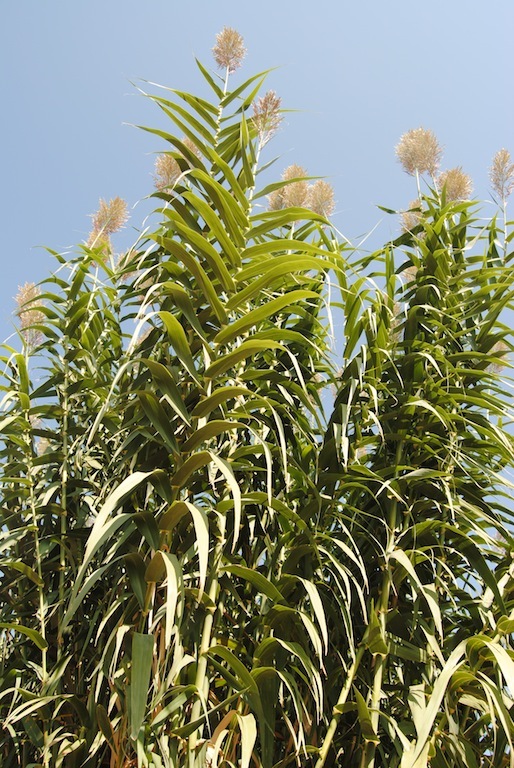 Arundo-K12 Arundo-K12 grows very well in a wide spectrum of climate conditions. It adapts to tropical, subtropical and temperate climates, and in these climates it often grows in areas of maritime influence. The most suitable temperatures regime is that of temperate-warm and subtropical climates. In the crop rest period however, it withstands well the frost of cooler climates; in plantations growing in Central Europe it has been seen to withstand temperatures below -20 degrees Celsius. The optimum temperature level to grow Arundo-K12 is broad, varying between 24 and 38 degrees Celsius. With regard to the water requirements, the species can be classified as Mesophyte, hidrophyte or xerophyte, because it grows in very different conditions; it can withstand very humid climates, almost water logging conditions, yet it also withstands prolonged periods of drought. In Mediterranean climates it can grow with an annual average rainfall of 300 to 400 mm. In our environment it can be considered as resistant to drought, as it withstands long drought periods coinciding with low atmospheric humidity (summer period of Mediterranean climates); this tolerance is given by the presence of rhizomes, which are resistant to drought. This rhyzomatic system is classed worldwide as being a plant structure highly efficient in managing resources. Arundo -K12 shows a great adaptability to a wide range of soils, from clay soils to gravel soils. Nevertheless, it prefers well-drained, loose soils, with soil humidity or with high water table. The pH range tolerated is 5.0 to 8.7. Noteworthy is its capacity to grown in sandy soils with low fertility, and the fact it withstands saline soils. Today this variety is also marketed for uses related to soil corrections. Los The components of the cultivation yield, in terms of amount of biomass produced per surface unit, are the plantation density, the number of stems per plantation point and their growth (height, diameter, basal and total dry weight). As usually happens with other perennial rhizomatic crops, the production of the year the crop is planted is usually lower than the following years; the rhizomes of the implantations are not yet well extended and therefore, the density of the stems is still low. 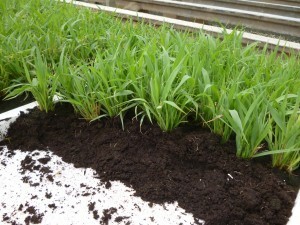 Moreover, part of the rhizome’s reserves must be used to form roots, so it is normal for the stems not to be very developed during the first year. In general, and although it depends on the plantation density (10,000 units/h), maintaining constant cultivation conditions (irrigation), typically the production of biomass the first year is about 20% lower than the following years. In warm climates and non-limiting conditions, the potential production of the energy crop Arundo-K12 can reach 80-100 tons of dry matter per hectare per year from the second or third year of cultivation. With regard to the irrigation effect, it has been found that a good water supply results in a sustainable increase of the productivity in Mediterranean climates. This fact does not necessarily imply, however, that it can be cultivated in rain-fed areas. Thus, some experiences indicate that in years subsequent to the establishment – conducted in irrigated land- the productivity in above-ground biomass of the rain-fed cultivated crop can reach 19 to 26 tons per hectare per year. “] The biomass harvested is of lignocellulose nature, and that is the reason why its energy use is currently aimed at thermal applications (solid biofuel) and biogas (anaerobic fermentation) either for heating or to generate electricity. Crop management (specially the fertilisation dose and the way of harvesting) and the growth rate of the plants (proportion of stalk against leafs) influence the composition of the biomass harvested and therefore, the calorific value. With regard to the standard solid biofuel (wood), the quality of Arundo-K12 biomass is slightly lower, yet in all cases comparable to that of other high quality perennial herbaceous biomasses. This lower quality results in higher emissions of particles and gases (HCI, SO2 and NOX). Regarding the calorific value and elemental parameters outstanding are the yields in NCV of more than 4000 Kcal/kg and a percentage of ashes of no more than 5%. The fixed carbon will be established around 18 to 19% together with 73% average volatility. In the elemental section we could emphasise a chlorine percentage in the order of 0.30 to 0.45% and an average sulphur level around 0.25%. The results shown correspond to the most aggressive product samples, being those of the tests performed in the period prior to the plant’s vegetative rest. This factor directly influences an alteration of approximately 15% in the most elemental parameters. Along with the novelty presented, also proposed are totally new and efficient manipulation techniques and harvests, which confer the crop an excellent viability. So far the aspect linked to the establishment of rhyzomatic varieties, among the Arundo Donax species, presented cost problems and even insurmountable coordination works. Given that today the polyvalent clone of Arundo-K12 is presented in a duly formed seedling format and with an absolute availability guarantee, sowing plans of more than 2,500 hectares per year can be safely and co-ordinately structured. Having reached the plantation point, this will be conducted generically with any crop in seedling format at a density of 10,000 plants per hectare. Depending on the condition of the soil this will require a personalised preparation technique. A series of compulsory tasks are determined alongside the sowing process aimed at strictly controlling the perimeter of each plantation. Prior to planting the crop, it is advisable to determine the soil’s fertility and, if applicable, its possible limitations, with a conventional soil analysis that includes the pH, organic matter, texture and nutrient content (N-P-K) that will serve as a guideline to perform the basal dressing. As general guidelines for the basal dressing, special attention must be paid to phosphoric fertilisation, with doses that could reach up to 200 kg P2O5 per hectare. In N-rich soils, it is not advisable to fertilise with N the first year to prevent the proliferation of weeds. With regard to potassium, if the soil is rich in this nutrient, it does not have to be added, as it could lead to luxury consumption that will affect the quality of the biomass. And yet, in soils poor in this element, doses of up to 100 kg N per hectare may be required to encourage the sprouting. To estimate the dose for the restoration fertilisation, the control of the soil’s level of nutrients can be monitored through soil analysis or either determine the restorations depending on the extractions from the harvest, taking into consideration the annual production obtained and the biomass analysis. 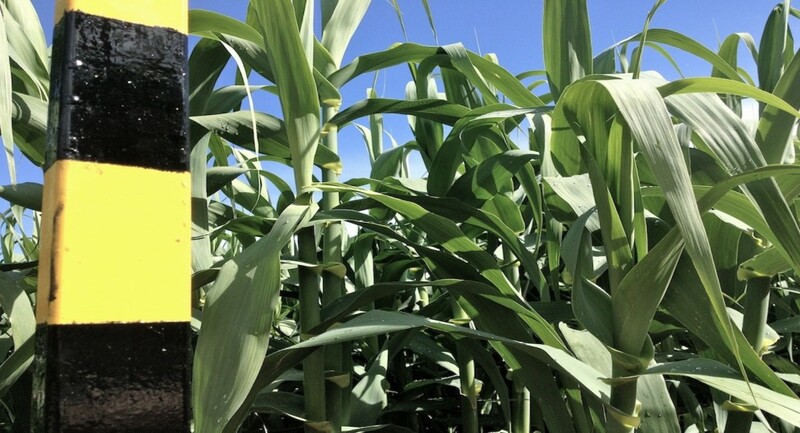 In different studies regarding the effect of nitrogen fertilising on the productivity of Arundo no significant differences have been found between the dose of 60 and 240 kg N per hectare, so it is thought that relatively low doses are sufficient for the crop. It is thought that up to 100 kg N per hectare per year could be applied, just before the new spring shoots grow. Nevertheless, and given that the crop may remain on the soil for many years, it is recommended to annually control the quality of the soil in order not to deplete it. In general conditions, a conventional fertilisation can be recommended with the complex 8:24:16 (balance 1:3:2) of 600-700 kg per hectare. The fertilisation shall be performed prior to the sprouting, at the end of winter or at the beginning of spring, with a conventional fertiliser broadcaster. Although Arundo-K12 does not have significant water requirements and can grown in drought conditions in many Mediterranean climates, its response to irrigation is significant in terms of sprouting and biomass production. For this reason, and with the aim of ensuring the establishment of the crop, it is advisable to provide irrigation the first year of cultivation. Once the planting establishment stage has been overcome, the crop is perfectly viable in average drought conditions although the productions will obviously depend on the real rainfall during the crop’s vegetative development stage. 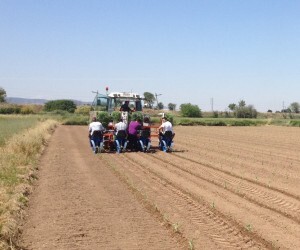 Water use efficiency (WUE) of arundo depends on the water conditions in which the crop has developed. It has been seen that plants with a high water availability (very irrigated) are usually less efficient than those that grow in rain-fed conditions. This fact, united to the crop’s tolerance to drought conditions, and to the similarity of the productivity obtained in tests with moderate and high irrigation doses indicate that it is more appropriate to apply conservative criteria regarding irrigation. As a preventive measure at the beginning of the plantation, it is recommended to use a pre-emergency herbicide for weeds that must be applied immediately after the planting. Normally, the crop then grows fast and aggressively, therefore subsequent weed control is not necessary, nor in the stages after the sprouting or the following cultivation years. [/acc_item] [acc_item title=”Harvesting“] src=”http://www.cultivosenergeticos.es/images/arundo_k_12/recoleccion.jpg” width=”300″ height=”300″ />At Biothek Ecologic Fuel we consider that the harvesting section is a key point for the crop’s viability. 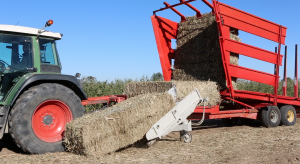 From tests conducted in real conditions, we can say that we have a highly efficient technique for the hay harvesting of the crop. It should be noted that the tests and works performed have been conducted in the province of Zaragoza (Spain) which has frequent stable winters with wind flows ideal for the hay harvesting of many low density fodder. Likewise we understand that the methodology and technology outlined below shall be valid for a wide range of conditions and environments. Cutting and conditioning: the cutting and conditioning shall be performed searching for the suitable plant and time balance for which it will be necessary to evaluate the plant’s climate and vegetative conditions. The best cutting time is established in the winter season or dry season, between the months of January and February, although the cutting work can be advanced up to one month. Once it has been cut, the drying time will be determined by the climate, although it is estimated that the drying time shall not be more than 20 working days. 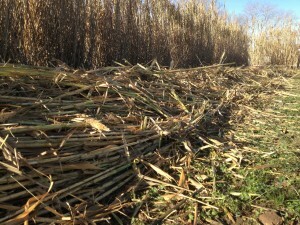 The Arundo Donax plant starts its total rest period in January, therefore it is at this time when we will achieve the lowest content of humidity and greater density, and it is at this point where, if the climate conditions of each area allow it, the cutting and conditioning should be performed. The appropriate technology for the work would be a Kemper type cut associated to an industrial conditioning system. All the system is set up to work jointly and self-propelled, thus avoiding runs, cuts and possible damages to new sprouts. This system guarantees a fast drying as we will achieve breaking and crushing the stalk transversally and longitudinally, thereby enabling the air to circulate, as well as not causing significant product losses. 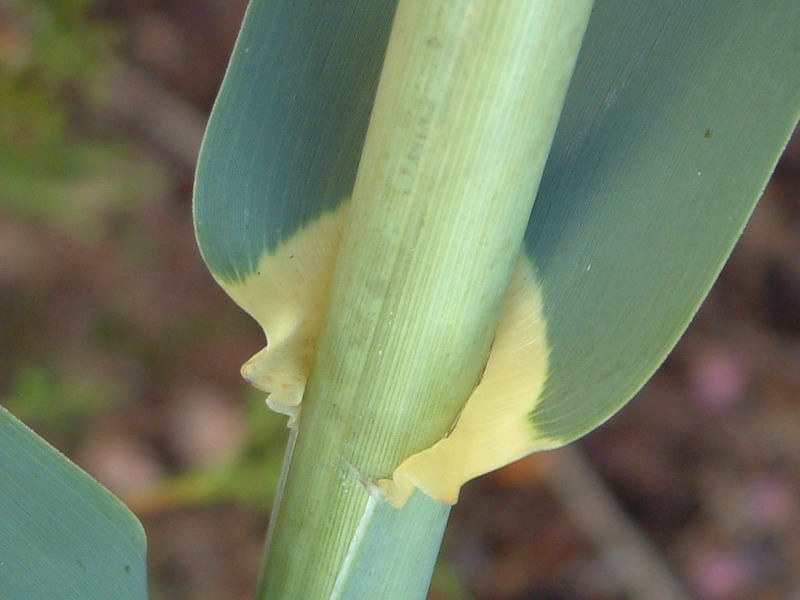 It is important to highlight that the purpose of the process consists of breaking the stalk yet preventing in any case the fragmentation or chipping. It must be noted that there will be environments where it will be complicated to apply the model proposed, and we therefore understand that you should evaluate each situation to structure the cutting and direct cutting based on the technologies receiving the final biomass. The technology consists of the adaptation of a packing and chipping equipment, both working in a symbiotic way. 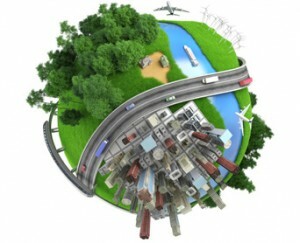 Thereby we will achieve minimising costs and simplifying all the transport process. 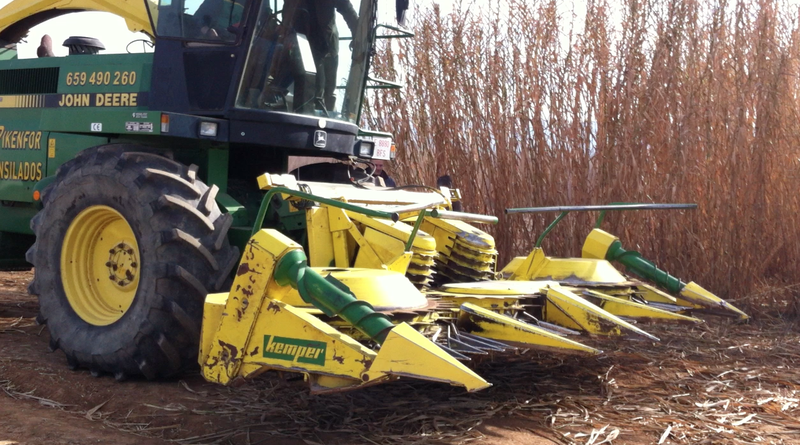 The general intention is therefore to bale the crop directly, with the chopper adapted to the pick-up system. With this system we shall ensure the product is duly chipped and densified with one single run. The most recommendable format is 90×120 cm and 2.40 cm long and approximately 500 kg weight. The bales produced will have a chip smaller than 9 cm. To tow this machine, 280 to 320 horsepower are deemed necessary. The collection of the bales shall be conducted mechanically and preferably with a self-loading cart. This collection system can be replaced for a traditional collection system, as would be the tractor’s hydraulic shovel. It is important for the storage piles to be arranged in such a way that the bales are ventilated, thus we shall achieve notably reducing the existing humidity.